Random House Books for Young Readers, 9780307931610, 96pp. New York Times bestselling, three-time Newbery Honor-winning author Jennifer Holm teams up with Matthew Holm to bring you a fully illustrated, award-winning graphic novel series packed with humor and kid appeal—BABYMOUSE! Winner of multiple Children's Choice awards and with over 1.8 million books sold, kids, parents, and teachers agree that Babymouse is perfect for fans of Junie B. Jones, Ivy and Bean, Bad Kitty, and Dork Diaries! You are cordially invited to the birthday event of the year! Babymouse is having a birthday and she wants it to be BIG! Mount Everest BIG. Eiffel Tower BIG. Tyrannosaurus rex BIG. (Okay, maybe inviting a T. rex isn't such a good idea). Will all of Babymouse's birthday dreams come true? Will she have a five-hundred-tier cupcake? 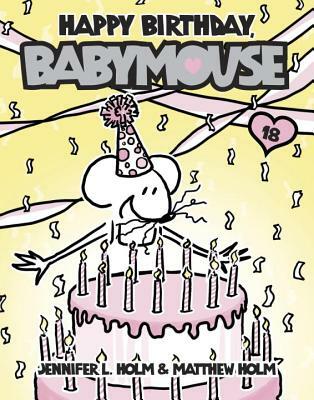 Find out in Happy Birthday, Babymouse—the eighteenth hilarious, action-packed installment of the beloved Babymouse graphic novel series by Matthew Holm and Jennifer L. Holm! Brother-and-sister team MATTHEW HOLM and JENNIFER L. HOLM are big fans of birthdays (and especially birthday cake). Jennifer is the author of several novels, including three Newbery Honor winners, Our Only May Amelia, Penny from Heaven, and Turtle in Paradise. They are also the creators of the Squish series.